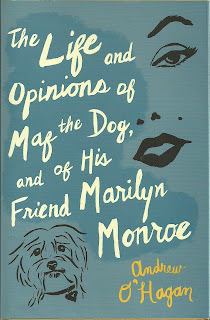 WOUNDED BIRD: and of His Friend Marilyn Monroe"
The Life and Opinions of Maf the Dog, and of His Friend Marilyn Monroe, by Andrew O'Hagan, is a moving and affectionate fictional account of the last two years of Marilyn's life as seen through the eyes of her Maltese, Mafia Honey - Maf, for short, a smart, funny, sweet, loving companion to Marilyn. Maf is so named because he was a gift to Marilyn in November 1960, from Frank Sinatra who was thought to have "connections" with the Mafia. Frank acquired Maf through the efforts of Mrs Maria Gurdin, Natalie Woods' mother, who regularly traveled to England to bring dogs to America. Maf hears the thoughts of humans and converses with animals and other living creatures around him. In case you didn't know, all cats speak in verse. Maf tries to talk to humans, but they hear his words only as, "Yap, yap." Maf becomes part of Marilyn's life just after her separation from Arthur Miller, when she is lonely and adrift. Frank then launches into a tirade against poor Peter that I can't quote even on my edgy blog which crosses so many boundaries. The book was a gift and a delight to read. I'm grateful to MadPriest, as I probably would not have discovered the novel on my own. 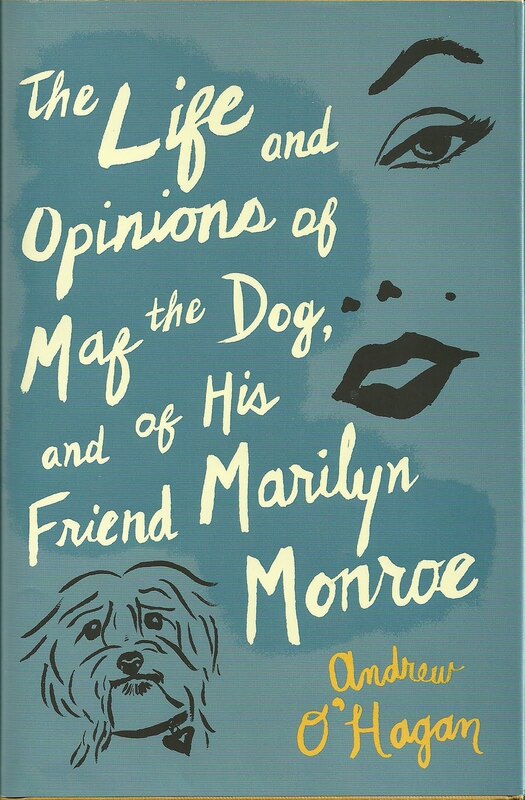 I enjoyed Maf's account of his life with Marilyn immensely. I laughed often, many times out loud, as I read. Certain critics say that the writer indulges in excessive name-dropping, but I enjoyed the stories of Marilyn's encounters with other famous people. Where real life ends and fiction begins is difficult to know, but that didn't matter to me. Once I accepted that dogs hear the thoughts of humans and cats speak in verse, the rest was easy. On a few occasions, I wondered about the characters, whether they were pure creations of the author's imagination or descriptions of early encounters with Marilyn by persons who later became famous. The characters mentioned only by their given names are perhaps more likely to be inventions by the writer. An instance is Vince, the doorman, a great fan of James Thurber, who shares Thurber's view of dogs and humans, considering dogs to be vastly superior. Thurber had gone so far into Vincent's mind that the doorman had Thurber-like thoughts, seeing people as alarming creatures and dogs as questing beasts. Along with the humor, a thread of sadness runs through the book, since the end is known, and despite his devotion, Maf is not able to save Marilyn. 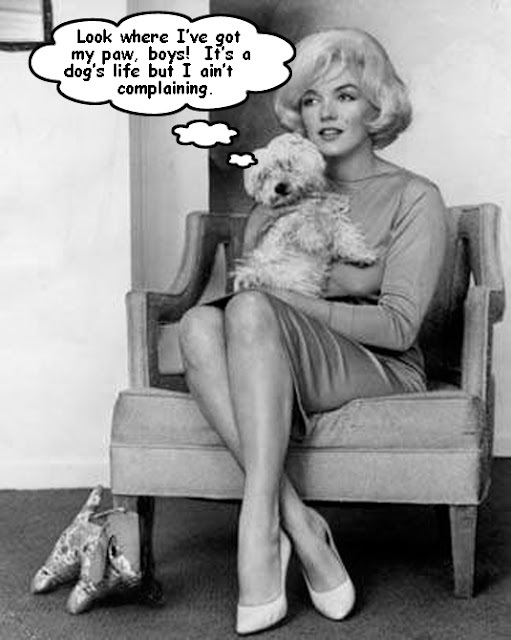 My above description of Maf,"smart, funny, sweet, loving companion" comes quite close to the little dog's opinion of Marilyn, who, I agree, has been much maligned and not nearly enough appreciated in the many, many words which have been written about her. Marilyn was late for everything: it was her creed, her prerogative, her style, and her revenge. I get it, I do, dear Marilyn. In my head, I understand why times must be set, but the rest of me resists having to be anywhere at a particular time, and I am often late. Marilyn and Maf, along with Carson McCullers, in full southern drawl, attend a literary party at Alfred Kazin's Riverside Drive apartment in New York City. Amongst the guests are the Trillings, Diana and Lionel, Edmund Wilson, Louis Howe, Lillian Hellman, and other literary lights. At one point during the party, the people named, except for Cullers and Hellman, are gathered in a small group discussing the contents of the Partisan Review. Changing the subject, Lionel Trilling speaks of the Great Books course which he directs at Columbia University and mentions the works of Freud and Diderot as being part of the studies. Wilson took another slug from his glass. 'It's not American, Lionel. It's English. It's French. It's German. And it's more English than anything.' Mr Howe took a step back, behind the sofa, as if to distance himself from anything that sounded like patriotism. Maf, being British, birthed on a farm in Scotland, coming to America by way of Bloomsbury, (yes, that Bloomsbury, the Bells and the Woolfs, Vanessa, Duncan, Leonard, Lytton, etc., but not Virginia, who has already departed) takes umbrage, and when Wilson leans down to put his empty whiskey glass on the floor, Maf bites his finger. 'I wouldn't worry about it,' said Mrs Trilling at the door. It was a pleasure to meet you. Your little dog has the most exquisite critical taste. We must find a place for him on the faculty. Certain of the literary elite are vicious in a civilized way, using words as weapons. The author's description of the relationship between Diana and Lionel is scathing, although, on the surface, the two strive to be the model of a successful literati coupling. From what I've read of the literary group's writing and what's been written about them, I'd say that O'Hagan gets them just about right. Both the small touches, like Louis Howe backing away when the conversation becomes patriotic, and the large splashes such as the words the author puts into Lillian Hellman's big mouth are often hilarious. You are all addled Troskyites, as dictated by lunacy. I'm sorry to say Comrade Trotsky is a traitor. I was glad I opposed his application for American asylum. Marilyn brushed out her hair, before pausing and resting the brush on her lap. I looked at her and realized this was our love story, too. I guessed I would never feel so close to anybody in my life. Not just because of the feeling she gave me, but the other things. I believe she taught me everything about what it took to have empathy. I believe she was like Keats in that way: her small efforts spoke of beauty and truth in ways that made her eternal. Watching her, listening to her thoughts, I was in love. She formed everything about me, including my sense of the novel. Even in anger, she looked at me and I understood the storyteller's vocation. 'A novel must be what only a novel can be - it must dream, it must open the mind. Ah, Maf's words are tender and lovely and make me tear up. I loved the novel, but I wish the author had spared us and Marilyn the scene near the end of Sinatra in another terrifying rage, the rage to end all rages, short of physical assault, because rather than stay at Sinatra's Rancho Mirage, JFK went to stay at Bing Crosby's compound up the road. After reading the account of the incident, I felt battered and bruised, and my heart went out to Marilyn who was actually there - maybe. Did the scene ever happen? I don't know, but O'Hagan surely made it come alive. I realize that my "review" of the book is long-winded, but I enjoyed the novel immensely, and I loved writing about it, so, even if no one reads what I've written, I'll have had my reward. If you haven't read enough, you may want to read the interview with Andrew O'Hagan in the The Herald (Scotland). You can purchase the book through the Amazon widget on the right sidebar at Of Course I Could Be Wrong and thereby throw a few pence MadPriest's way. NOTE: I changed the picture at the head of the post to add Maf's brilliant but naughty commentary supplied by MadPriest.